Some 38 years after he joined the London Symphony Orchestra, Lennox Mackenzie last night hung up his bow. In that time, he often sat in the leader’s seat, both on stage and off. He was the orchestra’s chairman from 1988 to 1992 and again from 2004 to 2016, the longest such tenure in its history. The conductors he worked with extend from Claudio Abbado, Colin Davis and Andre Previn to Valery Gergiev, Pierre Boulez and Simon Rattle. Before joining the LSO, Lennie was a founder member of the Arditti Quartet, then at the cutting edge of contemporary chamber music. I remember how chuffed the LSO were to have snagged him. We shall miss him on the front row. And a lovely chap to chat to! I was lucky enough to bump into him at the Usher Hall in Edinburgh where he was attending a San Francisco concert conducted by MTT. A real loss for the LSO. You can still see Lennie on some of Classic Arts Showcase’s videos. (CAS is the MTV of the arts but without commercials. It is available as a free satellite service that some cable providers carry on their public access channels, and it is also online 24-7.) I first noticed Lennox Mackenzie in a Natalie Dessay clip, “Glitter and Be Gay,” where you can see him stifling smiles during Dessay’s very entertaining and funny performance. I didn’t know who he was, soI looked up LSO’s orchestral personnel on line and soon identified him by name. I’ve been a fan ever since. Happy retirement, Lennie, from a fan in San Francisco. How many years as Concertmaster? Lennie and I both studied with Ralph Holmes. He made Lennie and almost ruined me. Teachers. They make or break. It stands to reason. He was the sub-leader, sitting number 3. Very rarely the concertmaster. 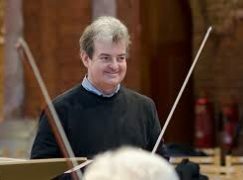 But as the longest serving Chairman, insuring the future of the LSO and remaining London’s oldest self governing orchestra. i.e. the musicians employ the management!